Some say that the easiest double century in our area is the spring Solvang Double. Yes, the climbing is less than most but with over 7,000 feet it is not quite like some real flat doubles in others parts of the country. Yes the total miles is a bit less than 200 miles. So for many people it is the best way to do your first double. But for me it is not so easy because, unlike with other doubles, people always want to know how fast you did it. So it is more like a race than an endurance event. I make matters worse for myself by starting with the 7:30 am group, which gets timed with the times posted on the Plant Ultra website. Actually I was feeling rather prepared for this double, even though it occurs so early in the season. For the first time ever, it was not my first double century of the year because I rode the Death Valley Double one month early. Maybe I was feeling a bit too confident because in the same week Anne and I did a little too much speed work, setting 3 new PRs on tandem hill climbs on Henry Coe, Thomas Grade and Metcalf. I don’t mean PR for this year, I mean our best time ever. In retrospect, maybe that was not such a keen idea to do only days before doing a double. Last year I completed Solvang under 10 hours. By under 10 hours I mean by about 20 seconds. I remember last year I felt I had a shot of breaking 10 hours about 40 miles from the end, which added a lot of pressure and drove me to push much harder than I might otherwise. I had no intention to do that again. I told everyone I was going to stop and smell the roses. I showed up at 7:15 and they started a roll call of those who wanted to be timed. Joining me was Paul D, Gary F, and Barley and Susan. I knew I was in trouble when I saw four tandems there. One was Barley and Susan, who I had ridden with a week ago and knew they were fast. Right at 7:30 a group of 62 riders were off. The tandem in the photo is what I call the 4th tandem later in my story. The reason why I knew I was in trouble with all those tandems is because two years ago I was not able to stay connected on the descent down Foxon Canyon, and lost the fast group at that point. Last year, with no tandems making the descent, I was able to keep with the lead group all the way to the second rest stop at 84 miles (we skipped the first rest stop). This year keeping with the pack was a bit of a strain but not overly taxing. We when up a couple of short hills and I would move right up behind the tandems and stay on their wheel as they went down. The first descent down Foxon Canyon went alright but on the second one, the same spot I lost the wheel two years ago, proved too hard. No matter how hard I tried, I just could not stay on the wheel and the group started to drive away from me, even though later I could see I had hit 50 mph. Being a poor sprinter meant I was working way too hard trying to catch them. I was actually making some progress and starting to close the gap. It was a race between either burning myself out or latching back on. I should have known better and backed off sooner and saved the legs for the many miles ahead. You can see from this graph, my heart rate was running in the red zone going DOWN the hill trying to get connected to the lead riders (click to enlarge). Soon after I realized I would not be able to close the gap, I was passed by a younger faster rider wearing a Furnace Creek 508 jersey. We worked together, although he was taking longer pulls. For awhile we were starting to gain on the lead group, but you can only drive that hard for so long. Soon the group ahead was vanishing from sight. I had lost my route sheet on the fast descent so I was not sure where the next turn was. The fellow 508 rider pulled his from his back pocket and started to read it. I road in the center of the road to give him space but even with that he cross wheels with me as he was looking at the sheet. Suddenly he was down, and extremely upset about it. But this was one tough dude. Even with some road rash and torn cycling shorts, he got back on his bike and we started off again. Just then we were pasted by the fourth tandem, along with a couple of other riders drafting behind them.. We jumped in the group and stayed with them for a few miles, but they stopped and the first rest stop so we went on without them. Only one other rider skipped the stop and rode with us, another one wearing a Furnace Creek 508 jersey. Kind of like 3 FC 508 guys, but the others were much younger and stronger than I was. Several miles down the road, as we were making a right turn, a group was coming back toward us, having missed the turn themselves. Yes, I thought. I was now back with a larger group. I moved up toward the front of the group not wanting to get dropped on some of the rollers ahead. I thought I would be able to stay with them until the 2nd rest stop, but my legs were burning from trying to catch the lead riders earlier. It just didn’t seem worth the effort, so after about 5 miles I let them go and started riding solo, something I would do for much of the rest of the event. I was a bit worried without a route sheet but eventually did catch a couple of other riders. Having no route sheet, I wanted to stay with them so I did not get lost. Although I wanted to go a bit faster, I was afraid I would miss a turn, so I ended up mostly pulling.. The problem is that this small group did miss the turn and we went about 3 miles before we realized it. So by the time we got back on course we had biked an extra 6 miles. Just as we got back on the course I saw Paul D. He rode with us for a mile or so but then started to cramp and dropped off. Soon after that we passed Louise. Once I knew I had made the final turn before the second rest stop, I moved ahead and rode solo. At the second rest stop I saw that I had averaged only about 19 mph, compared with close to 22 mph last year when I had stayed with the lead group, but this year I had now biked 92 miles before stopping for food and water. I guess that was some sort of record for me. It might have been my imagination but there seemed to be more headwind. I was riding that stretch along Highway 1 toward Moro Bay by myself into the wind. About 6 miles from Moro Bay a group of about 8 riders came up from behind, so I joined them. I saw a couple of riders ahead, both wearing the same jersey. As we passed them, I could see it was Art and Patrice. I stayed with the small group until the lunch stop. I was thinking to keep with them, but they were taking longer eating their sandwich than I wanted to wait so I headed out alone. I never saw them again until I was waiting at the finish after taking a shower, so it is a good thing I didn’t stick with them. Several miles before the 4th rest stop, while waiting at a traffic light, the 4th tandem came up, the one that had stopped at the first rest stop. They had only one other rider with them, so I joined the small group. The two of us on single bikes would take turns doing some pulling. As we kept passing riders, they were jumping on the train, but they were all wheel suckers. I took another pull and tried to move back into the group but these wheel suckers would not let me in, wanting to keep their spot. Forget them I thought, and I just went ahead and dropped the entire group, again riding solo. At the 4th rest stop I saw Gary S. and Gary B, who were about ready to leave. After mostly solo riding, I finally made it to the the last rest stop where I saw Chuck, who had started at 6 am. By now I had passed all the other club riders, except of course Gary F. and Barley and Susan on the tandem. I knew Gary was probably about two hours ahead of me, which meant he was already enjoying the finish line. Ann was there and took his picture. I didn’t spend much time at the last rest stop, knowing the end was not far. It was up Drum Canyon Hill, a part I really like. I enjoy climbing this hill and passing all the other riders who hate to climb, especially after 180 miles. But unlike last year when I was climbing at full speed to make some time, I kept it much easier. I made the turn on the final highway, with the slight uphill and then the down hill. While going down, I was passed by the 4th tandem and a bunch of riders. I had to accelerate quickly but was able to finally close the gap. I rode with them to the end. I knew the tandem started at 7:30 but I think most of the rest of the group had started earlier. I finally made it to the finish, taking a total of 11:16, which was more than a hour slower than last year. Part of that was due to riding an extra 6 miles and part was from doing a lot more solo riding. I still felt I was working hard and when I looked at my data later, my average heart rate was even higher than last year. Of course that might be because I am just getting older. 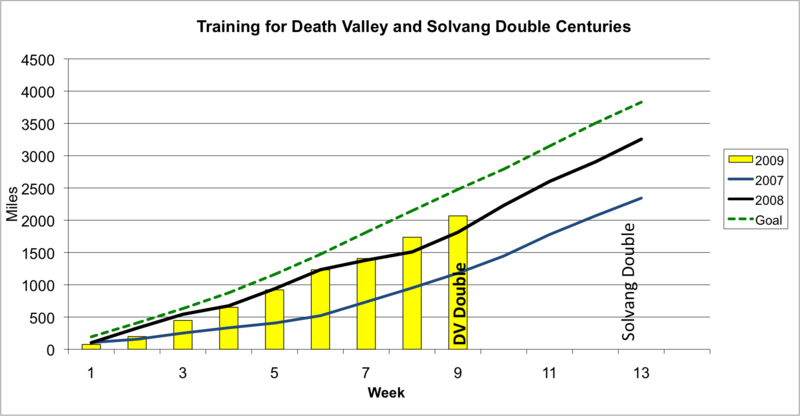 These two tables show a comparison with my prior Solvang Doubles. My stopping time at the rest stops was a bit more than last year but the crash did cost me some time while I helped the rider back up on his bike. Overall I am happy with how I did. A little older, a little slower, but still riding alongside the young bucks. My only regret was even though I was slower, I never did see any roses to smell. My thanks to Anne for taking all the photos in this blog. See all her photos of Slovang here. It was still dark when I stopped at Gary’s house to pick him up. After a drive up to San Jose, we arrived just in time. It was getting light now and the temperature was not too bad, warmer than last Saturday. We had enjoyed wonderful weather on Friday but I knew this day would be much cooler. Ann was not able to join so I was on my single bike, which was too bad because there were two other tandems, Russ & Sheila and Barley & Susan. Most of the group was together as we started to climb up Calaveras. It was not long before five of us went ahead of the rest of the riders and the two tandems. 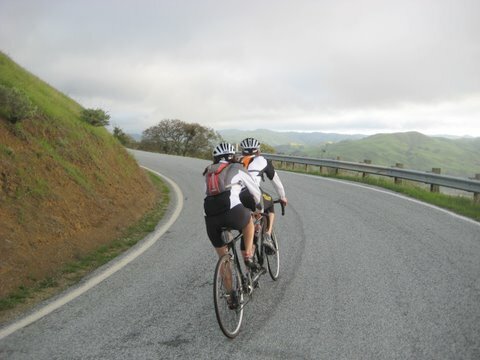 After climbing the “wall” we started through the rollers along the Calaveras Canyon. Our group now was down to four including myself, Gary, Brian and Vince. Brian was taking pictures of us from the back while riding which was amazing considering we were moving rather quickly. Then Brian went ahead, to get a front shot! Not sure how he did it because I thought we were cruising right along. At least I thought we were moving along and was surprised that we were suddenly passed by Barley and Susan, who were making a very fast pace through the rollers. I raced to jump on their wheel thinking I should be able to hold on with all these curves. I know I have to slow down when cornering on the tandem, but Barley has a lot more courage than I do. I was starting to slip off the back. Gary went around me and was able to connect with the tandem. By now Brian had dropped off the back and we were soon joined by Guy. The three of us were trying to connect with the tandem before the descent but that last climb was just not long enough so they were over the top and headed down fast. 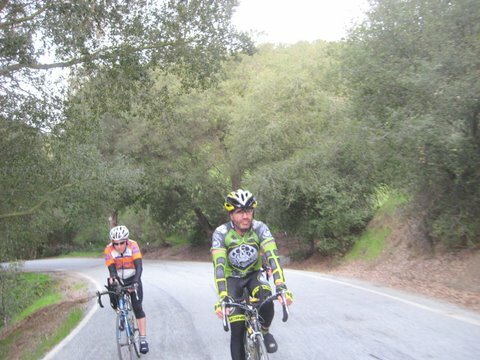 Three of us, myself, Vince and Guy, worked together as we were headed to Sunol, trying to close the gap but never seeming to make any progress. Gary was riding in the tandem draft, RESTING! It was not until we finally hit some traffic lights that we joined up. We road together through Livermore and before heading to Mines Road three riders stopped to get water. I was afraid to stop so I was the only one that followed Barley and Susan as they continued on. On the way up Mines Road, Gary and Vince finally caught us but we did not see Guy again that day. I was so glad to be climbing up Mines road because my heart rate was now much lower than it was on those flat sections and rollers. We all stopped at the Junction Cafe for maybe 10 minutes, just enough time to eat something small and get water, then it was off toward Mt. Hamilton. I was feeling fatigued at this point but was able to keep reasonably close to the rest of the group. Except for Gary, I caught everyone on the last climb before the descent down to Isabel Creek. I was so happy we had finally hit the backside of Mt. Hamilton. I know that sounds strange, but for me I like climbing and it is much easier for me to keep with the fast riders when we are climbing, especially that wickedly fast tandem of Barley and Susan. I decided to time myself up the backside, although I knew it would not be that fast since it was well into a long ride and I was not going to be racing up. At the top I did a split and found my time was 46:30. I waited there for awhile, wondering how far the others were behind, but no one was coming up. It was a chance to put on my jacket and eat some more food. It was cold so I decided to head back down the hill about a quarter of a mile to see where everyone was and then I saw Barley and Susan down below coming around a corner. I waited for them and climbed up to the summit and along the flat to the Observatory where Gary was waiting. The tandem didn’t stop but headed straight down, even though Susan was in short sleeves and it was now 48 degrees! Gary and I started down the hill but I never descend as fast as he does, so soon he was out of sight. About 3 miles down the hill I suddenly got a massive cramp in my right leg and had to stop for a short while. I was wondering if I was going to be able to get out of the pedal with the cramp, but managed somehow. I was surprised to get cramping in such cool weather and when I was going down the hill. After a couple of minutes I was feeling good enough to go on and was okay the rest of the ride. Gary was waiting at the bottom of Mt. Hamilton and Barley and Susan had already gone on. The weather was starting to look more threatening so we headed the 7 miles to the car. At 2:30 pm, it started to rain. Gee why could it not wait until 3:00 pm like the forecast. We got wet enough but were glad it was at the end of the ride and only for 20 minutes. I was glad when we finally reached the car and got the bike inside my minivan. Gary and I headed into Erik’s Cafe and Gary bought me a sandwich. That sure tasted great. When I got home I went to the King of the Mountain Page to see how fast I climbed up the backside of Mt. Hamilton before and found my best time last year of 46:53, 53 seconds slower than I just did on this long ride. Then I noticed our time up on the tandem last year was 49:45. That must be a mistake. Even thought that ride was up the front and just down to Isabel Creek, how could we climb up so fast. 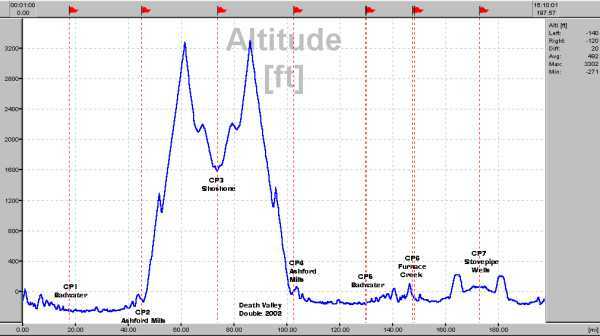 I opened up the data file I had downloaded from my Polar heart rate monitor and saw this graph of that ride last May. Yes, I had taken my heart rate well into the red zone at times climbing the backside. I then checked the splits where I would have recorded our climb time and sure enough we had done it in 49:45 over 4.6 miles as I had put on the KOM page. I am not sure how we did it that fast. Since we were in the 60-64 age group, that record might stand for awhile. Death Valley received its name in 1849 during the California Gold Rush. It was called Death Valley by prospectors and others who sought to cross the valley on their way to the gold fields. 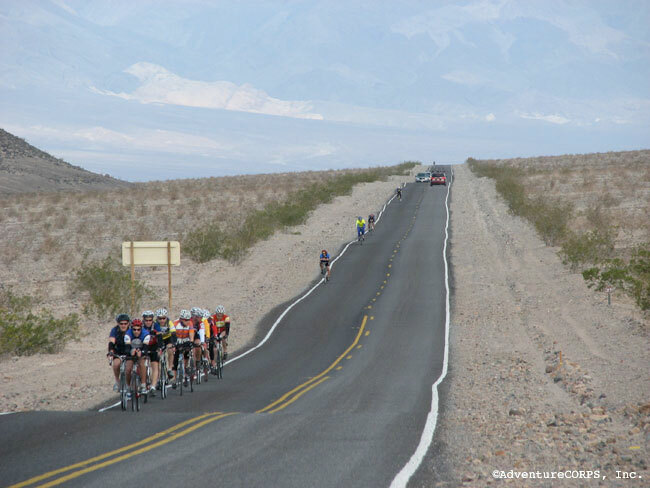 I realized how much has changed since then until today when numerous cyclists cross death valley each year. Late last year I received an email that they had just opened registration for the Death Valley “Spring” Double and right after that I got a call from Gary F. telling me he was signing up. In an impulsive moment I went on their website and signed up, just before they reached their 300 rider limit in the first hour. Then I was starting to wonder how I was going to get ready. I was going to be traveling a lot in November and December and that left only two months to get in shape. It was kind of like cramming for a final, except the body can only develop so fast. So during the first two months of 2009 I biked more miles than I ever had so early in the year. Although I did not feel like I was fully prepared, I was close to the training program I had laid out for myself for the first two doubles this year. On Friday Gary, Louise and myself carpooled down to Furnace Creek. After a 500 mile, 9 hour drive, we finally arrived at the Furnace Creek Ranch Lodge where Gary and I were sharing a room. As often happens on these type of events, I did not sleep that well. I woke up at 1:30 am and not quite sure if I ever went back to sleep. Gary and I decided to try to get in with the first wave of riders so we were up early and to the start line by 5:45. But they had 50 people already there and they held us back to start 10 minutes later with the second group. I was not too worried about that but I knew that it meant Gary would need to bridge the 10 minute gap somehow to catch the fastest riders ahead. It was just getting light as we started off at 6:10. Riding in the desert at sunrise is something so beautiful that it is impossible to explain and needs to be experienced. In the foreground was the vast expanse of Death Valley and looming far in the distant was the Sierra Mountains, with snow caps on Mt. Whitney. In our group of 50 I saw a couple on a tandem, but not just any tandem. It was a very high priced racing tandem and they were both wearing Everest Challenge Jerseys. That is the State Climbing Championship I participated in last year so I figured I could draft behind them. But they turned out to be not fast enough and I eventually went past them. Not too long after that we formed a pace line of about 9 riders and worked together for about 40 miles when we stopped for water and food. I made a quick stop and decided to go ahead without the group since we would be climbing up Jubilee within 7 miles. From that point on it was mostly solo riding for me. This double is two parts, the first part is out to Shoshone and back to Furnace Creek. 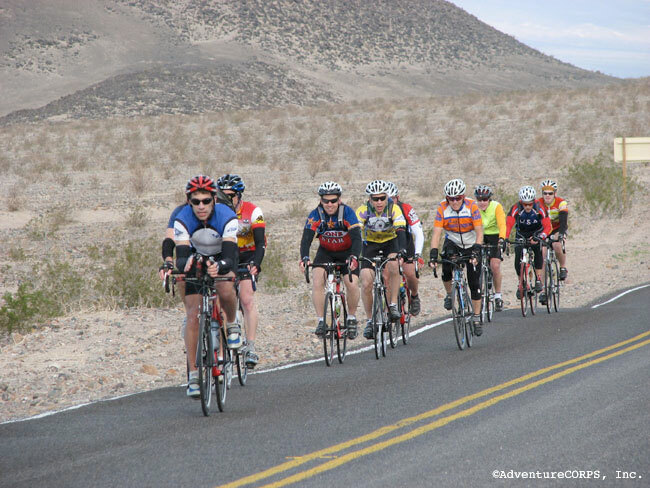 This is stage 4 on the Furnace Creek 508, but both times I was the “A” rider so I had not cycled on these roads. So instead of being sleepy eyed in the support van watching Paul V. bike in the middle of the night, I had the chance to ride in the daylight. It was wonderful weather, not too hot, not too cold, not too sunny and not too cloudy. I could not have asked for better cycling weather. When I got to the base of Jubilee, I noticed that I had already “climbed” over 1,500 feet, which showed how many rollers we went over. Jubilee Summit was at 1,290 feet and then after a short descent it was a very long climb up Salsberry. I passed several riders during the climb up to 3,300 feet at the summit. I guess these were all riders in the group that had started 10 minutes before us. I could see a tandem ahead and was thinking if I could catch it before the summit I could follow it down the other side. I was able to make a connection just before we hit the crest and attempted to keep in their slipstream as we zoomed down the hill. I finally found myself pedaling as fast as I could and watched them slowly slip away from me even though they were “coasting”. “Wait a minute” I thought, I still had a long way to go so I gave up the chase. After we leveled out I found myself in a stiff headwind, bringing my speed down to 11 mph. I was starting to worry because the winds last year during this event had caused a high DNF rate. But the wind lasted for only about 10 miles and although it seemed to always be a head wind for the rest of the ride, they were not that strong. I made a quick stop at Shoshone and headed back. On the climb back up Salsberry, I saw the same tandem again but found it easy this time to catch them. Again I tried to keep in their slipstream down the very long descent but once again I finally gave up. It is breathtaking to descend from over 3,315 feet down to below sea level. Once I was back down to the valley floor, it was a short ride back to the rest stop to get more water. From there I had about 30 miles to reach Badwater, where there was a lunch stop. That seemed like the longest 30 miles. I was on the verge of bonking and was out of water as I pulled into Badwater. Badwater is a basin in Death Valley and is the lowest point in the US with an elevation of 282 feet below sea level. It was also for me the lowest point in the ride. I realized I needed a break so sat there for nearly 19 minutes enjoying a sandwich, a coke, and a V-8. I was now feeling much better and headed off. 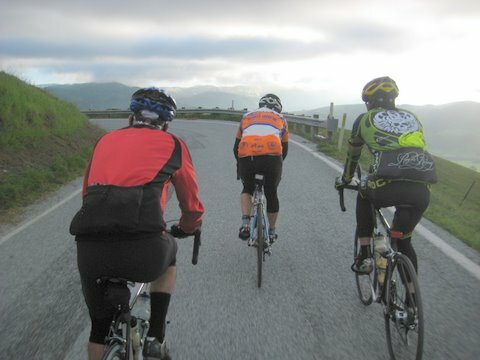 I grouped with two other riders, one was wearing a Furnace Creek 508 jersey from last year. I had been with him early in the day with the small pace line we had formed. I was chatting with him and he indicated that he had only been on the bike 4 times since last October’s Furnace Creek 508. “Wow”, I thought, how could he do that. He said he had been swimming and running. I asked him if by chance he had run the Badwater Ultra marathon, put on by the same group putting on this event and the 508. “Yes”, he said, “4 times”. This is the hardest running race I know of, covering 135 miles non-stop from Death Valley to Mt. Whitney. He said he had finished 4 times and had completed both the Badwater Ultra Marathon and FC 508 solo in the same year (his totem is Desert Duck). He is only the second person I met who had completed both events and the first to do it multiple times. I reached Furnace Creek for another stop, I saw Gary’s coach there who had already finished. That meant he had finished the last 50 miles out to Stovepipe Wells and back before I even started out. Yikes, I guess I had better get going. So after a 10 minutes stop I headed on, riding solo once again. I was now riding on the same road I had ridden twice during the FC 508, except in reverse. What surprised me was that this road had a lot of rollers. When doing the 508 I always thought this section was flat. Doing it in the dark made it hard to see the ups and downs and I had thought the difference in effort required was due to the shifting winds. But now I was measuring as much as a 300 ft. change in elevation through the rollers. About 5 miles from the turn around one fellow did pass me so I jumped on his wheel for awhile. Then I felt like I could pull and went around him. A mile or so later I glanced back and he had fallen way off the back so I just went ahead by myself. 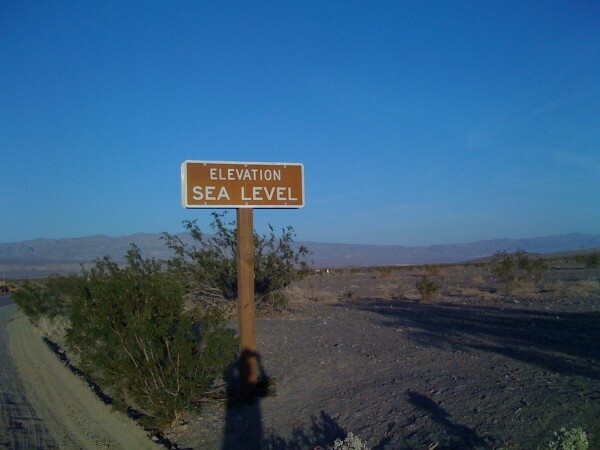 I finally reached Stovepipe Wells, which is right at sea level. At the turn around point they offered me a cup of noodles. Hum, that sounded good so I sat down and enjoyed it since I wanted to make sure I had enough energy to finish. After a 13 minute rest, I decided to bike to the finish. It was getting late in the day so I decided to turn on my lights before I headed back to Furnace Creek for the last 25 miles of the ride. One fellow joined me but he had a simple CAT-eye light so he enjoyed following me with my bright light. I was thinking he liked following me a bit too much because he never took a pull. Oh well, at least in the dark it was safer to have two riders together. I finally pulled into Furnace Creek at 7:30 pm, for a total time of 13:20. Gary, who had finished two hours earlier, was there to meet me. I was happy I was done. Not long after I finished the fellow with the totem Desert Duck pulled in. I asked him if he was going to do the Badwater Ultramarathon and FC 508 again this year. He said he was taking it off because he was going to do a triple Iron Man instead. “Yikes”, I said, “what is a triple Iron Man?” He said it was “7.5 mile swim, then 336 mile bike and 78 mile run.” But he added, “I have 60 hours to finish”. I started to feel like a wimp for having a hard time finishing only 200 miles on the bike. After eating some more food, I headed to the room to take a shower and then went back out to the front to wait for Louise. I slept well that night. Checking my data later I found I had averaged 16 mph over the course of 197 miles and 9,300 feet of climbing. My total stopping time was about 1 hour. Although I had not pushed myself as hard as I had on some other doubles, overall I was happy with how I did. Maybe I should be thinking about doing a triple Iron-man, NOT!